1) As many of you know, today, January 11, is Diana Gabaldon's birthday! (She's 61 today.) So I thought I'd devote one of this week's Friday Fun Facts to a minor aspect of Diana's writing style that I like a great deal. Here's Roger and Bree in ECHO, reading one of Claire's letters. Diana loves parentheses, and has been known to nest them three levels deep, in posts on Compuserve -- which never fails to make me laugh. Look here for a particularly entertaining example of what I mean. You'll see her do this in blog posts from time to time, too. 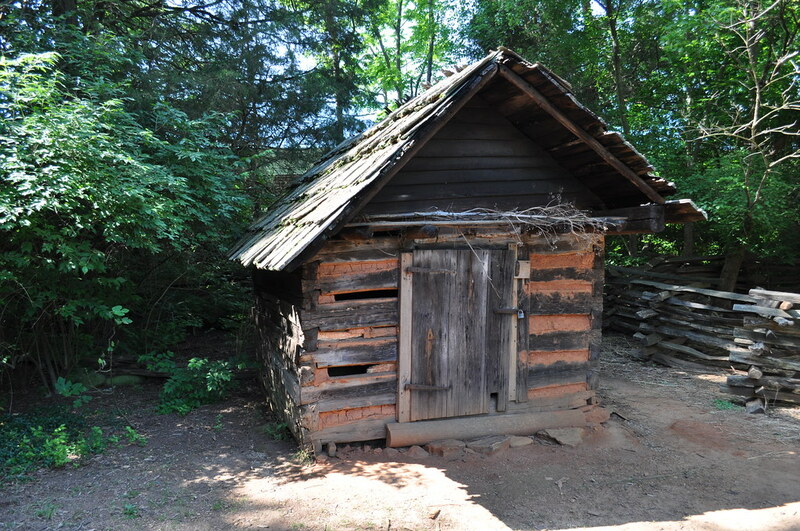 2) The photo above shows a smokehouse at the Schiele Museum of Natural History in Gastonia, NC. (Click on the photo for a bigger view. Photo credit: DJEPS on Flickr.) I think it looks very much like the one Jamie built just after they settled on the Ridge. This seemed a sound idea; particularly in view of the sort of beasts in the area. My only doubts were regarding the smoking. I’d seen it done in Scotland, and knew that smoking meat required a certain amount of attention; someone had to be at hand to keep the fire from burning too high or going out altogether, had to turn the meat regularly, and baste it with fat to avoid scorching and drying. I had no difficulty in seeing who was going to be nominated for this task. The only trouble was that if I didn’t manage to do it right, we’d all die of ptomaine poisoning. The diagram above shows the design of a typical 18th-century American smokehouse. This is the interior of a smokehouse built in 1810, located at the Genesee Country Museum Pioneer Farmstead in Mumford, NY. Click on the photo to see a bigger view. For more about smokehouses, look here. There it was. He gasped, couldn’t help it, though it made all the soldiers look at him, conversation interrupted. It had to be. He knew the look of a prison well enough. Huge round towers set in a grim high wall, and the filthy brown water of a broad river flowing past, flowing under an iron-barred gate. The Traitors’ Gate? He’d heard of it. All of them were grinning at him, maliciously enjoying his shock. He swallowed hard and tensed his belly muscles. They wouldn’t see him cower. His pride was all he had left--but he had enough of that. The name Traitors' Gate has been used since the early seventeenth century. Prisoners were brought by barge along the Thames, passing under London Bridge, where the heads of recently executed prisoners were displayed on pikes. Queen Anne Boleyn, Saint Sir Thomas More, Queen Catherine Howard, all entered the Tower by Traitors' Gate. I've never been to London, but if I ever get the chance to go, the Tower is one place I'd like to see. 4) The Mischianza described near the end of AN ECHO IN THE BONE was a real historical event. The picture above shows one of the tickets issued to guests attending the event on May 18, 1778. The Latin phrase at the top, "Luceo discedens aucto splendore resurgam", means "I descend in light, and shall rise again in splendor", according to this site. It had been quite a long time since I’d seen a gilded roast peacock, and I hadn’t really expected to see another. Certainly not in Philadelphia. Not that I should have been surprised, I thought, leaning closer to look--yes, it did have eyes made of diamonds. Not after the regatta on the Delaware, the three bands of musicians carried on barges, and the seventeen-gun salute from the warships on the river. The evening had been billed as a “mischianza.” The word means “medley” in Italian--I was told--and in the current instance appeared to have been interpreted so as to allow the more creative souls in the British army and the Loyalist community free rein in the production of a gala celebration to honor General Howe, who had resigned as commander in chief, to be replaced by Sir Henry Clinton. Here is a detailed account of the Mischianza written by one of its organizers, Major John André, whom you may recall from ECHO. 5) Remember the story Jamie told Brianna while she was in labor, about Habetrot the spinstress? "Aye, well. It happened that in an old farmhouse that stood by the river, there lived a fair maid called Maisie. She’d red hair and blue een, and was the bonniest maid in all the valley. But she had no husband, because…” He stopped, appalled. I glared at him. Brianna made a deep inhuman noise. Jamie clenched his teeth for a moment, but went on, holding tight to both her hands. “But Maisie loved the light in the fields and the birds of the glen..."
I had never heard of this folk tale until I read DRUMS. You can see one version of the story here. Oh. I get to be first! I so appreciate the research you do for us. Thank you! I thought that was going to be the Rumplestiltskin story, but I like this version better! Thanks for the link! Yes, I thought it was going to be Rumplestiltskin, too. Long story, poor witches! Hello Karen! the 2nd FFF of 2013 are great!Whenever I read your FFF,I write down any inf.I find interesting, which chapter of which book it's referred to, on bits of paper,then insert them into the books to the right chap.and page. "ptomaine"poisoning,I'd have known that ptomaine comes from the greek word "ptoma"(corpse)since I speak Greek everyday with my husband and know the language rather fluently! The Tower of London is an eerie place but beautiful, we were there 3years ago.So many people encountered terrible fate there... If you ever go to London, don't miss the Tower! The Crown Jewels are kept in the Tower (in the basement I think)they are fantastic!I read the entire folk tale about Habetrot,enjoyed it very much, felt like a child.. Thanks a lot Karen and looking fwd to next Friday.